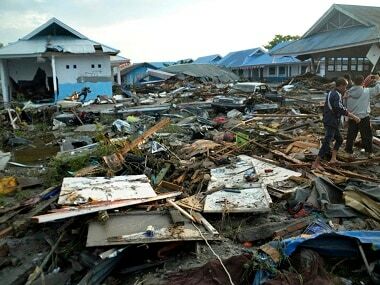 Palu: The death toll from a powerful earthquake and tsunami in Indonesia leapt to 832 on Sunday, as stunned people on the stricken island of Sulawesi struggled to find food and water and looting spread. In Palu city on Sunday, aid was trickling in, the Indonesian military had been deployed and search-and-rescue workers were doggedly combing the rubble for survivors – looking for as many as 150 people at one upscale hotel alone. A Facebook page was created by worried relatives who posted pictures of still-missing family members in the hopes of finding them alive. Amid the levelled trees, overturned cars, concertinaed homes and flotsam tossed up to 50 metres inland, survivors and rescuers struggled to come to grips with the scale of the disaster.